When people think about climate change, they probably think first about its effects on the environment, and possibly on their physical health. However, climate change also takes a significant toll on mental health, according to a new report ecoAmerica just released with the American Psychological Association. We found that climate change-induced severe weather and other natural disasters can cause mental trauma and shock due to personal injuries, loss of a loved one, damage to or loss of personal property or even the loss of livelihood. The intense negative emotions that can dominate people’s initial response may eventually subside, only to be replaced by lingering post-traumatic stress disorder. Additionally, the impacts of climate on mental health are not relegated to disasters alone – significant psychological damage can also stem from more gradual, longer-term climate influences. Changes in climate affect agriculture, infrastructure, and livability, which in turn affect occupations and quality of life and can force people to migrate. These effects may lead to loss of personal and professional identity, decreases in social support structures, loss of a sense of control and autonomy, and feelings of helplessness, fear and fatalism. 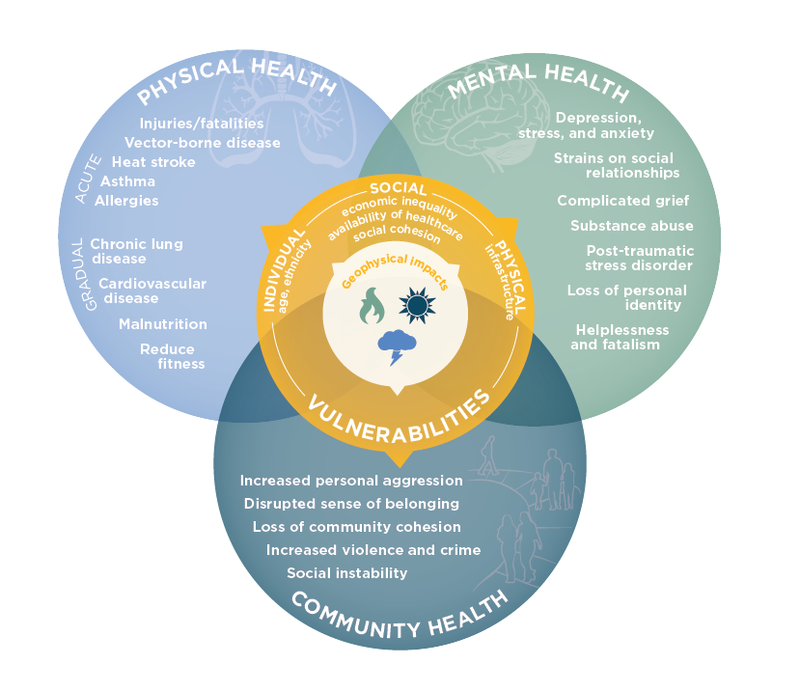 Worry about actual or potential impacts of climate change can lead to stress that can build over time and eventually lead to stress-related problems, such as substance abuse, anxiety disorders, and depression. Building resilience is the key to combating the potential negative psychological effects of climate change. Our report offers guidance to aid professionals in supporting and promoting the mental health of individuals and communities and helping them build psychological resilience. One recommendation is to guide people to support and maintain their social networks. Our report also emphasizes that adopting environmentally friendly policies and lifestyle choices can have a positive effect on mental health. For example, choosing to bike or walk to work has been associated with decreased stress levels. Also, increased accessibility to parks and other green spaces could benefit mental health as spending more time in nature has been shown to lower stress levels and reduce stress-related illness, regardless of socioeconomic status, age or gender. The report, which was produced in collaboration with psychologists Susan Clayton, PhD, of the College of Wooster, and Christie Manning, PhD, of Macalester College, is an update to Beyond Storms and Droughts: The Psychological Impacts of Climate Change, a report we released in 2014 in collaboration with the American Psychological Association. A seminal work on the relationship between climate change and psychology, Beyond Storms and Droughts was cited in the U.S. Global Change Research Program’s scientific assessment, The Impacts of Climate Change on Human Health in the United States. 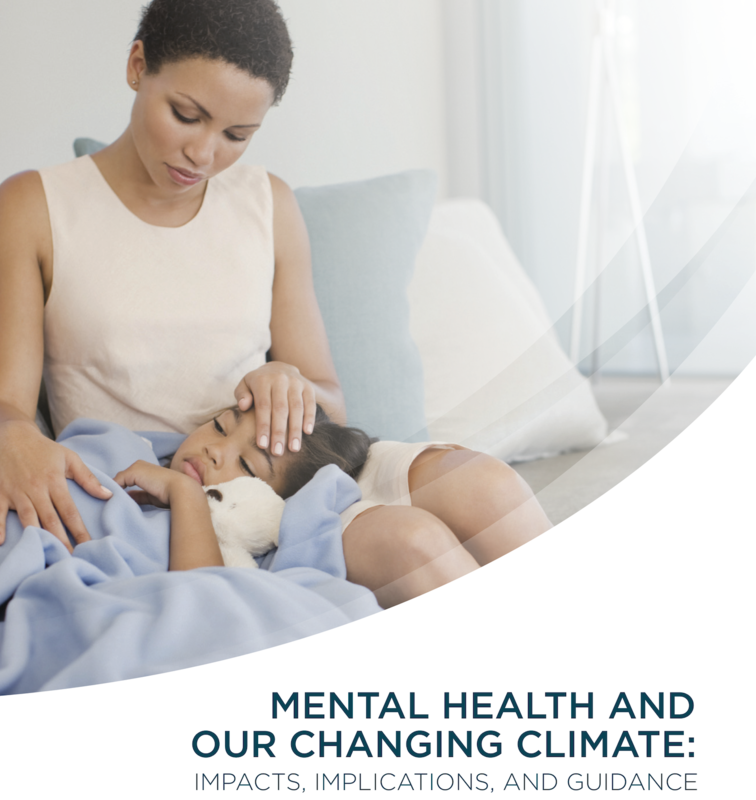 This 2017 update builds on the findings of the first report with new research, expanded emphasis on inequity, deeper guidance for individuals and communities and stories from professionals who are studying and supporting mental health in a changing climate.